homemade caramel. there is nothing better to eat or to make during the holidays, especially since you can use this recipe in several ways: regular soft and chewy caramels like we’re going to make today, homemade chocolate-covered caramels, caramel chocolate-dipped pretzel rods, and homemade turtles. one recipe of this caramel will make a bunch of each of these, so it’s worth it just to try it out at least once and you can taste-test several treats all at the same time. this is the homemade caramel recipe that my sister has been using for years and her christmas candy spread wouldn’t be complete without all of the caramel candy named above. she gave me the recipe a couple of years ago and every time i made it i did something wrong. first, i made caramel sauce, which was great but it wasn’t what i was going for. and then i made it again and there were little brown bits throughout…it still tasted great but didn’t look very pretty. but i’ve learned and adjusted a couple things and i’ll make sure to share them with you throughout the post so you can make the perfect batch of homemade caramel on attempt no. 1! one of the great things about this recipe is that it only has 4 ingredients. if you’re like me, you’ve already got light corn syrup such as karo (because you can’t help but make this brown sugar and cream syrup for french toast every now and again), evaporated milk, sugar, and butter at home. it’s 1 stick (1/2 cup) of butter and 2 cups of everything else. so if you’re buying evaporated milk in the cans, you’ll need 2 of them to get 2 cups and will have a little left over. also, you will want to have everything pre-measured so you can just add it when it needs to be added. once you have everything ready to go you’ll need to grab a pot with as heavy a bottom as you have and melt together the corn syrup and the sugar over medium heat. until it starts to boil (like pictured) and reaches a temperature of 236 degrees F. once you’ve hit that number, add in the butter. adding the butter will bring the temperature down and so you need to keep stirring it, making sure nothing is sticking to the bottom of the pot, until the temperature reaches 240 degrees F (aka the “soft ball” stage). pro tip #3: slide the thermometer to another place within the pot from time to time to make sure you’re stirring underneath it, too! once you’ve reached the 240 number, you need to add your pre-measured evaporated milk. be careful, it will start to sputter a little bit, so add it in a slow and steady stream, even allowing it to stream down the inside side of the pot to prevent it from being poured too quickly. the evaporated milk will definitely bring down the temperature of your caramel mixture and you don’t want to completely lose your boil, so be sure to add it in slowly while trying to maintain some of the boil. keep stirring with your wooden spoon, making sure that nothing is sticking to the bottom of the pot. for this final stage you want to get the temperature to 226 degrees F. pretty specific, right? but it works, so that’s what we do. make sure you are stirring the bottom of the pot the entire time as this is when it will start to burn for reals if you don’t keep a close eye on it and you will end up with tasty, but unsightly little brown pieces of over-cooked caramel. this is also the stage where you really start to see the caramel color…so pretty! 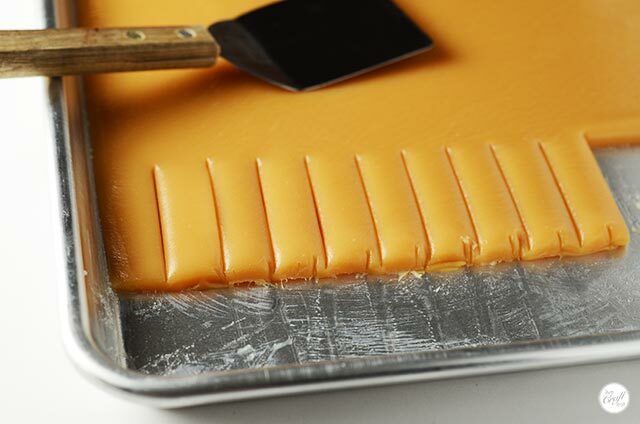 once you’ve reached the magic number of 226, you are ready to pour out this lovely amber-colored thickened liquid into your already greased baking sheet. i mean, really. look at the picture! it is absolutely divine. 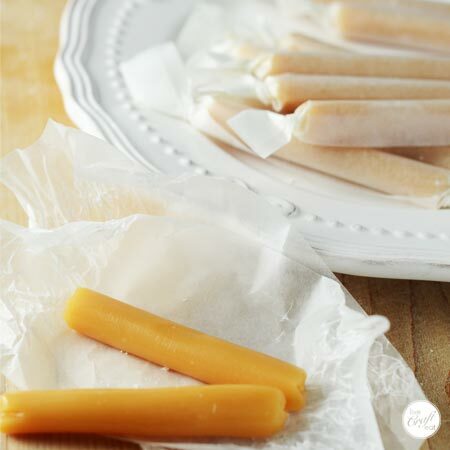 it is so smooth, and once it cools off a little bit you’ll have the most wonderful chewy and soft caramels. i seriously can’t wait to make this (and eat this) again. if it’s winter when you’re making this and your garage is super cold you can put the pan in there to help it cool faster, or even outside if it’s cold enough out there. if all else fails, just set it onto hot pads on your counter. it doesn’t take very long to cool no matter where you put it. around 15 minutes, maybe, depending on the temperature of the room. but it won’t be long before you’re able to cut into the caramel like the picture below. these are approx. 2″ x .75″ rectangles and these are what we’re going to use to make our rolled caramel candies. you could get a ton of caramels out of one cookie sheet if you wanted. and you could get even more if you go for shorter, chunkier caramels instead of the long and thin shape ones that i’m making. cut out several of the caramel strips and have them ready to go. to wrap them up i used precut waxed paper squares (aff link) and cut them in half. they started out at 6″x6″ so i ended up with a bunch of 6″x3″ rectangles. 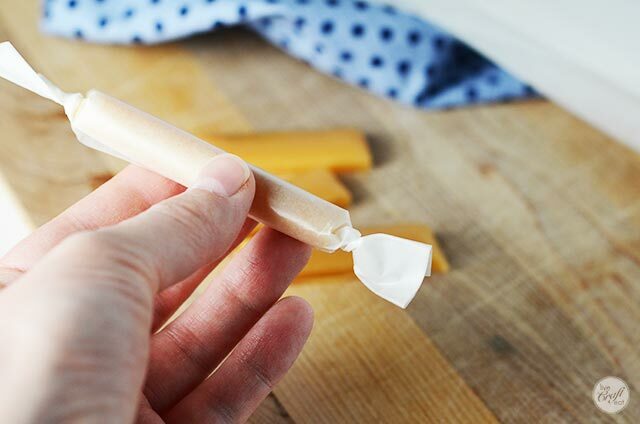 but you could cut smaller pieces of waxed paper if you’re making smaller caramels. since i think rolled caramels should be round and not flat, i took the caramel rectangle and rolled it in my hands. the only way i can think to explain this is to say “the way that your kids roll play dough in their hands to make a play dough snake.” you know? 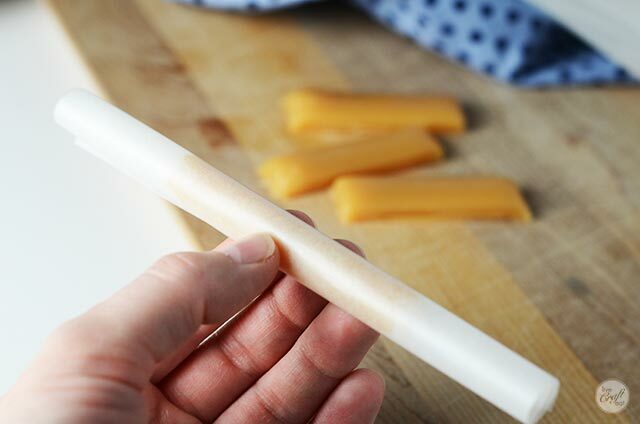 the caramel is soft so it will actually get a little longer than the length you cut it when you roll it. 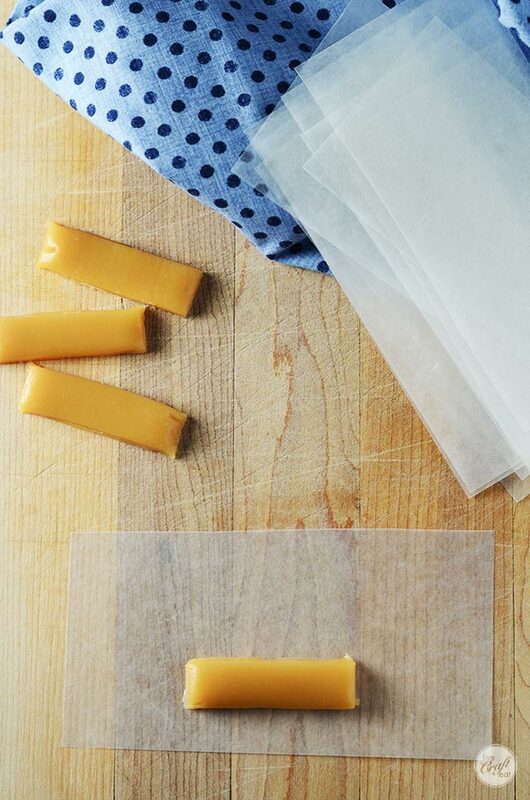 once they’re rounded, place them on the bottom edge of the waxed paper and gently roll them up. then all you have to do is gently twist either end of the waxed paper. it will stay in place! and it just looks so cute. finish rolling and wrapping as many caramels as you want to give to neighbors, friends, co-workers, or to keep for yourself…whatever you want to do! either way, they are so soft and chewy and awesome, i really wish you could try one through the screen right now. you would be totally convinced of their deliciousness and would be making your own tonight, for sure. you could also sprinkle a little sea salt or fleur de sel (aff link) to really send them over the top. 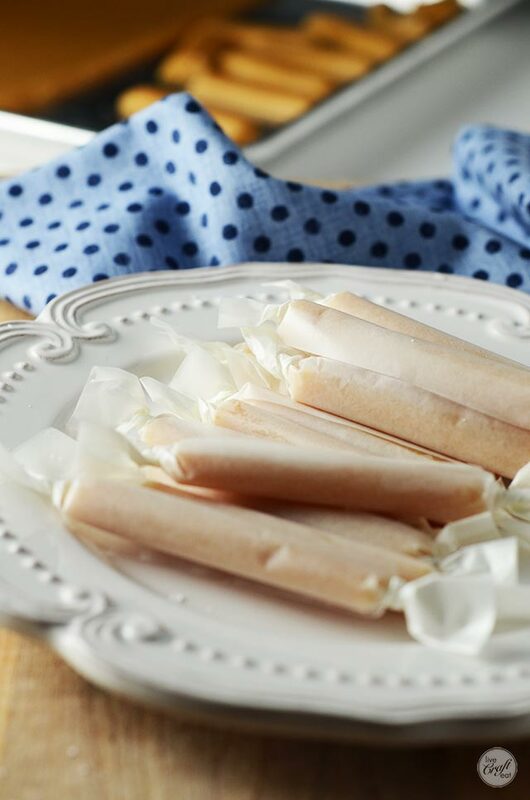 whether you like them plain or salted, you are going to be one happy caramel candy eater after trying this recipe. and speaking of…here it is! enjoy! 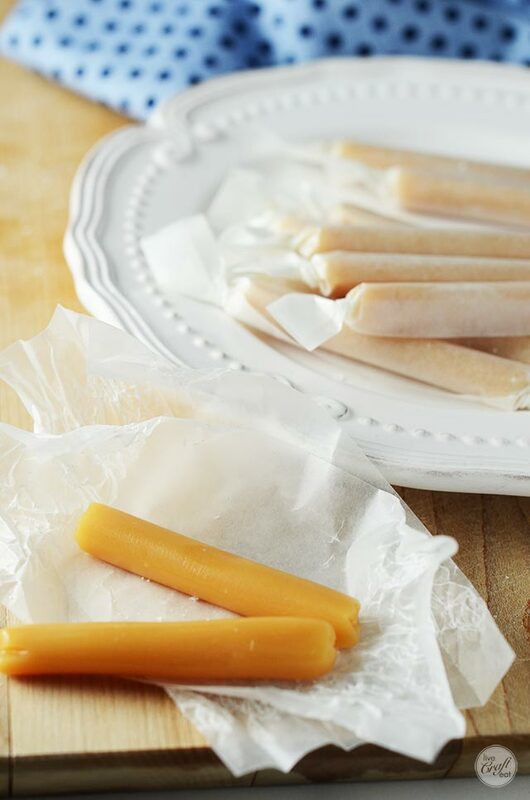 these soft, chewy, creamy caramels are so easy to make at home. bonus: they require only 4 ingredients! combine the karo syrup and sugar in a large, heavy-bottomed pot. 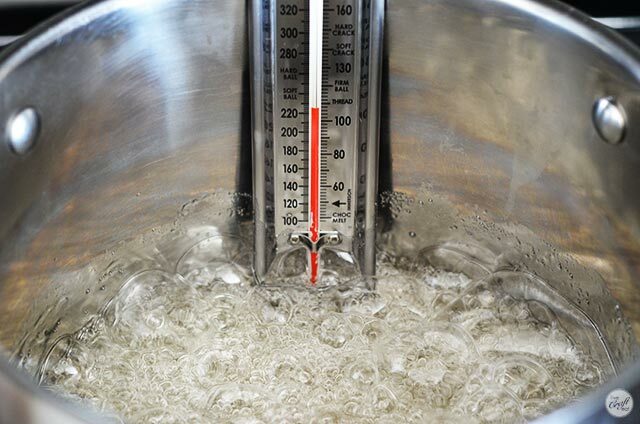 place a candy thermometer onto the side of the pan. cook over medium heat, stirring with a wooden spoon, until the mixture reaches 236 degrees. add the butter and cook mixture up to 240 degrees ("soft ball" stage). 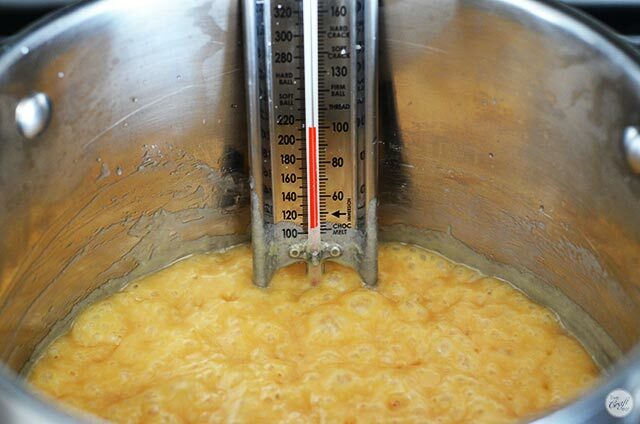 add evaporated milk slowly, making sure to maintain a boil, and cook until mixture reaches 226 degrees, stirring constantly so it doesn't stick to the bottom of the pot. 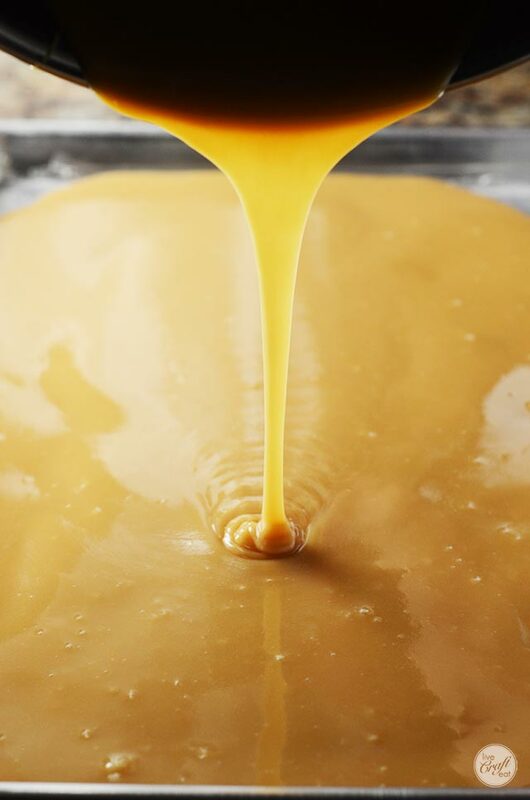 pour caramel onto greased baking sheet (do not scrape the sides of the pot...just pour until it starts to slowly drip and then get the pot into hot water so the remaining caramel doesn't stick and it's easier to clean!) and allow to cool. 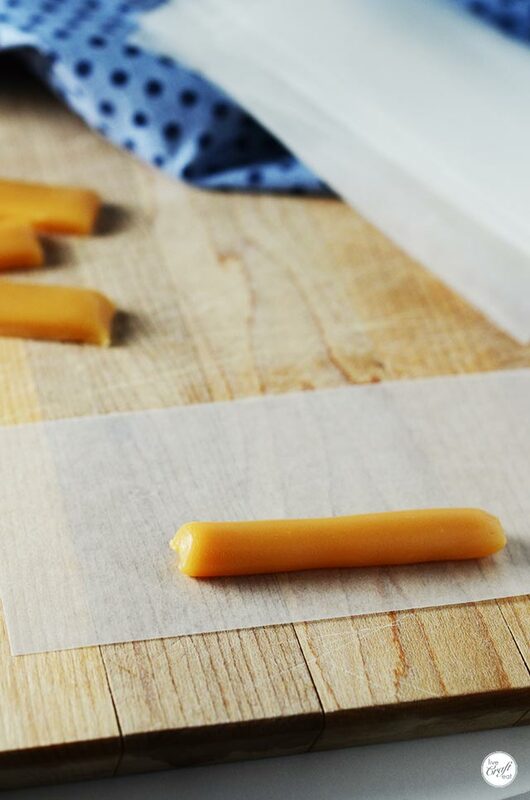 once cooled, cut the caramel into small rectangles, roll, and wrap! congratulations! you just made the best caramel ever! 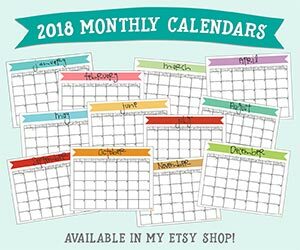 if you love this post and want to save it for later, don’t forget to pin it! homemade caramels – only 4 ingredients! How big of a baking sheet did you use? I have 1/4 sheet and half sheet. i actually don’t use salted butter – but if you wanted it to be more of a “sea salted caramel” you could absolutely add some salt! It will be a liquid when it’s ready to pour. When it cools it will definitely thicken up and set. 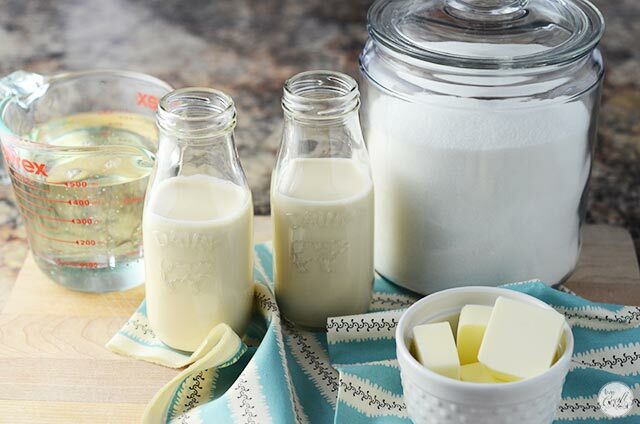 Can you substitute heavy cream for the evaporated milk? Nope. Or not that I know of anyways!